The Oregon Skyline Trail! Here is one of its highest crossings, now redesignated the Park Butte Pacific Crest Trail crossing. Interestingly, however, a recent photo (2005) taken by a friend showed this historic sign still in place, looking unchanged from when I myself had photographed it in 1971.... Hurrah!......Mt. 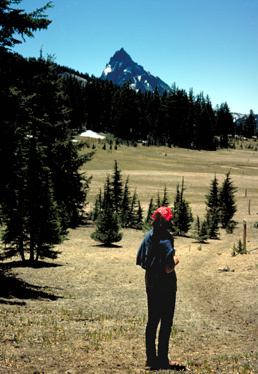 Hood, Oregon's highest peak, looms in the background. In the near distance is Olallie Butte (olallie is a Chinook word for "berry")....If you turn around at this spot and look south, there is a very near and impressive view of the north side of Mt. Jefferson.... Expect to be hiking portions of this trail crossing on snow even at the end of August during most years! Note the peak of Mt. Rainier to the left of Mt. Hood. It'sseen in the distant background, well over 100 air miles away (it's the dim white thing being pointed at by the hemlock frond). Highest Point of PCT trail in Oregon! Above you see Maidu Lake, alive with morning mists... It is the source of the North Umpqua River, and for unknown reasons carries the name of a California Indian tribe. Maidu Lake is remote by anyone's standards, even in the 21st Century. It is poised on the Cascade divide between Western Oregon and Eastern Oregon, lying at just under 6,000 feet.... Across the lake rises 8,000 foot high Tipsoo Peak (a Chinook word for "grassy"). Beyond Tipsoo lurks the dark spire of Mt. Thielson. The PCT crawls over the left shoulder of Tipsoo, reaching a lofty 7,570 ft. In the picture above, the PCT is located just barely to the left of where the trees end on the left shoulder of the peak. This location is best accessed from Miller Lake, where the dirt road ends. The hike toward Maidu can also take you near 7,271' Red Cone, which is a fun Class 5 scramble that ought to be roped for anyone inexperienced. The picture to the left shows you the view southward once you reach the shoulder of Tipsoo and start down the other side. Mt. Thielson dominates the view! From where this hiker is standing, if you climb to the summit of nearby Howlock Mountain, a marvelous panorama will unfold. This summit is only about 800 feet higher, and about 3 miles to the SSE. (click to see this panorama). At page bottom you will find a very interesting tale about famous Scottish botantist David Douglas and his 1826 visit to the canyons just west of Maidu Lake. Here's background before hearing of Douglas' adventure. Oregon of 1826 was decades away from Statehood. It had no towns or cities. No roads ran through it. There were no phone or telegraph lines. Train tracks were yet to be laid. The future Oregon was ruled by the 1818 Treaty of Joint Occupation between America and England. The entire region was wall-to-wall wilderness with a few scattered forts and fur company trading posts--- and no fortified locations within a two week march of Douglas' small band of explorers that October. Oregon's first major wave of settlers were still twenty years in the future and there was nothing called the Oregon Trail in existence. Outside the walls of the few forts and trading posts, the many bands and tribes of Indians had only heard rumors and tales of the White Man. In the case of Douglas' trip to the Umpqua region, the rumors were likely to have been dark ones. In the late Fall of 1818, the Umpqua region had been scarred by violence, when a white party of 60 men from the North West Fur Company had killed 14 Indians near the present site of Yoncalla. As no White deaths are noted in the account, one must suspect that the event was somewhat of a massacre. Thus in 1826 an encounter with any band of Indians in the Umpqua region was an entirely uncertain proposition which might end in a nasty death. And family and friends back in Civilization in New York or London would hear only, "He left Fort Vancouver on (date) and was never heard from again." Modern Freeway travelers on Oregon's largest freeway, Interstate 5, will marvel at the clear waters of the Umpqua River as they pass through the town of Roseburg, but the journey up the River from there in Douglas' day was daunting indeed-- 106 miles of rugged travel along game and Indian trails through dense forests. If Douglas had tried to reach Maidu Lake in the headwaters, it would have taken him at least a week of difficult travel. "SUGAR PINE, A BOTANICAL HORROR STORY"
The following year (1826) Douglas spent the summer travelling up and down the Columbia River east of the Cascades, and collected plants all the way up into the Blue Mountains of Eastern Oregon. But the mystery seeds in the smoking pouch remained on his mind, and in the early Fall of 1826 he found his opportunity when he visited the newly-dedicated Fort Vancouver. Here he found a large party of Hudson Bay Company personnel who were headed south into the region where Douglas believed his pine trees were to be found. Dr. John McLoughlin was the new Chief Factor of the Fort. McLoughlin had Scottish roots on his mother's side, and had taken his medical training at the University of Edinburgh, so it wasn't surprising that Douglas found himself gifted with a prize horse. Dr. McLoughlin was destined to loom large in the history of the West, later being officially honored as "The Father of Oregon." Douglas' travelling party numbered nearly 20. Their route was pointed into the present area of Roseburg, 180 miles to the south. By mid-October Douglas and his several white and Indian companions reached the Umpqua River, most likely where Elk Creek joins the river. This location is roughly halfway between the Pacific Ocean and the present-day site of Roseburg. They set up a base camp there. It had been a long and arduous trip, and food had often been short, with many hungry days due to rather erratic hunting success. It was wild, primeval country, but exciting, and the party had examined many giant-sized tree specimens, and also been excited by large wildlife such as elk and grizzly bears. Finally, on the morning of October 23rd, 1826, Douglas' long-sought search for the mystery pine moved into high gear. He left his companions and headed upriver in the company of a single Indian guide that he'd just met, supported by just two horses, one of them Dr. McLoughlin's. After two days of very rugged and tiring travel the two men had made only about 22 miles and stopped for the night in very heavy rain. They were far east of the Umpqua River in hilly upland country. He writes, "Last night was one of the most dreadful I ever witnessed. The rain, driven by the violence of the wind, rendered it impossible for me to keep any fire, and to add misery to my affliction my tent was blown down at midnight, when I lay among Pteris aquilina rolled in my wet blanket and tent till morning. Sleep of course was not to be had. Every ten or fitteen minutes immense trees falling producing a crash as if the earth was cleaving asunder, which with the thunder peal on peal before the echo of the former died away, and the lightning in zigzag and forked flashes had on my mind a sensation more than I can ever give vent to; and more so, when I think of the place and my circumstances....before sunrise clear, but cold...completely drenched...still shivering....I was seized with a severe headache and pain in the stomach, with giddiness and dimness of sight; having no medicine except a few grains of calomel... I could not think of taking that and therefore threw myself into a violent perspiration and in the evening felt a little relieved." The next day he travelled 18 more miles, this time headed south toward a likely ridge that he felt might be good habitat for a pine. Along the way, he crossed back to south side of the Umpqua River and set up camp several miles past the River. On the morning of October 26th, he left camp to the care of his Indian guide and went on alone. After walking perhaps another 3-5 miles he had a tense encounter with an armed Indian who suddenly appeared. After apparently gaining this man's trust, the fellow was shown a quick tree sketch and agreed to lead Douglas to the pine trees he sought. This led to another two or three hours of hiking in the mountainous terrain. Suddenly Douglas found himelf among giant pine trees that fit the description he'd dreamed of for over a year. In great excitement he carefully measured a very large specimen that was a fallen tree. It was over 57 feet in circumference and its trunk revealed that it had stood 215 feet tall (if alive today, this tree would be the largest of its kind in the Northwest). 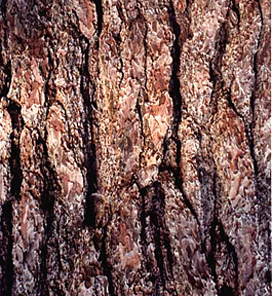 Image: Sugar pine bark is much-furrowed and bears a distinct resemblance to Ponderosa pine bark, but the crown of the mature Sugar Pine is very distinctive and hard to confuse with anything else by virtue of its having prominent branches growing far out at nearly right angles to the trunk. Ponderosa pines, aka Yellow Pines, are much more numerous and widely-distributed than Sugar Pines. In the pre-dawn darkness, his Indian guide burst into camp "in great terror and hurry, and uttered a shriek. I sprang to my feet, thinking the Indians I saw yesterday had found me out, but by gesture I learned he had been attacked by a large grizzly bear." The tale continues after daylight, when Douglas had followed the bear on horseback and discovered that it was a mother with two cubs, "I levelled my gun at the heart of the mother [bear]." After he has killed the mother bear, and also has shot one of her two cubs, he makes payment to his guide, "with the carcase of the young one I paid my last guide, who seemed to lay great store by it." Adding to Douglas' trials as he attempted to escape downriver, the weather was horrible. He notes succintly, "Heavy rain throughout the day," and the next two days of travel are no better, "both days very rainy, and having very little clothing and impossible to keep myself dry night or day obliged me to make all the exertion in my power to reach the camp near the sea...[my horses] being greatly fatigued and the road [route] daily getting worse by the continual rain...Boiled the last of my rice for supper, without salt or anything else, and had but a scanty meal." The third day of Douglas' escape featured more stress, "when one of the poor horses [the one given by Dr. John McLoughlin] fell and descended the whole height [of a large woody hill] over the dead wood and large stones, and would have been inevitably dashed to pieces in the river had he not been arrested by being wedged fast between two large trees that were lying across the hill. I immediately tied his legs and head close to the ground to keep him from westling and with my hatchet I cut the lower tree and relieved him, [the horse] having received but little injury." Arriving back at base camp finally, Douglas found that all his white companions were away on various journeys, leaving only two Indian companions, from whom he learned the very bad news that the local Indians "had been troublesome." That night the exhausted Douglas first coped with "very heavy rain during the night.' Worse by far, he notes, "last night around ten o'clock several Indians were seen round our camp all armed, and of course instead of sleep we had to make a large fire, leave camp a little distance, and hide in the grass to watch. An hour and a half before day[light] a party of fifteen passed us, crashing among the grass toward our fire; we immediately fired blank shot and scared them....returned to camp....I had not a single bit of dry clothing and it [was] still raining." In the same region, just two years later, an Indian-laid attack was highly successful, when Jedediah Smith's party of 19 men was ambushed by "Lower Umpqua" Indians and only four of the men escaped alive to report the sad tale weeks later at Fort Vancouver. For Douglas' endangered party, the following day featured "heavy showers...cold and raw." At noon an Indian who had been a guide for some of Douglas' companions returned, which might have been a good sign, but for the fact that the fellow "brought on his back one of their coats and had in his possession some of the hunting implements, and looked altogether very suspicious; for the present, as we do not understand their language, we pay no attention; perhaps he has stolen and not murdered them.... I find myself greatly fatigued and very weak." The next day was November 1st, and finally matters began to improve somewhat when his white companion and friend "Baptist Mackay" returned from the Oregon Coast, "telling me he hardly ever experienced such bad weather; he had not a dry day. We felt a little relieved to think our small party getting strong." November 2nd, 1826 marked the end of Douglas' major trials when Mackay shot "a fine large doe" for food and around 4pm thirteen of their companions arrived in five canoes. "I find this evening pass away agreeably [compared to] the eleven preceding [evenings] ... to have a visage of one's own colour is pleasing; each [person] gave an account of the chase in turn. I find myself [to] stand high among them as a marksman and passable as a hunter." On November 7th, Douglas and two Hudson Bay Company employees left the Umpqua for the long journey back to Fort Vancouver. In a reflective moment, Douglas writes, "When my people in England are made acquainted with my travels, they may perhaps think I have told them nothing but my miseries. That may be very correct, but I now know that such objects as I am in quest of are not obtained without a share of labour, anxiety of mind, and sometimes risk of personal safety." POSTSCRIPT: In the classic Bible of Western trees, none other than George Sudworth himself unabashedly states that the Sugar Pine is "the largest and most magnificent of the Pacific white pines, if not all the timber pines of the (Northwest) region." ('Forest Trees of the Pacific Slope," 1908, and reprinted many times since). John Muir was also a great admirer of the Sugar Pine, calling it the "Queen of the Sierras," and with good reason because the Oregon mountains really mark only the northern edge of the Sugar Pine's range, with the best and most extensive forests of them found in the central Sierra Nevada mountains, the region where John Muir most loved to explore. Faded into history now is Na'tele, the orginal Umpqua Indian name for the Sugar Pine. Pinus lambertiana Dougl. now commemorates David Douglas' discovery for all time. 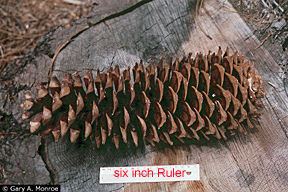 In modern times, the Sugar Pine has been so highly valued as a timber tree that it is now classed in a low-level of risk category as an endangered species, due to both extensive logging and to disease attacks. Footnote: The Tragic End of David Douglas. The life of a frontier botanist was indeed hazardous. Just eight years after escaping death while identifying the Sugar Pine, Douglas met his end at the age of only 35 while on a botany trip on the Big Island of Hawaii. The circumstances of his violent death were investigated for over forty years, but the most likely scenario was that he was again travelling alone, and had the bad luck to display his money pouch to a known felon, and was murdered for his money. He is buried on the island of Oahu in Honolulu, certainly thousands of miles from the country of his birth, and even thousands of miles distant from the frontier United States in which he had made so many discoveries. Note: in pre-White man times, the traditional "trade" language of the many widely-scattered bands and tribes of the Northwest was Chinook. It was a very simple language replete with much signing and gesticulation, and was absolutely essential to the region's economy becasuse the hundred-or-so Native languages were largely mutually incomprehensible. Thus, despite the remoteness of the Roseburg/Umpqua area from the main trade corridor along the Columbia River, it was likely that at least a some of the Indians in the story above were able to communicate with the Douglas party's Chinook interpreter, Mr. Michel Laframboise. Copyright 2008-2019 by Bruce B. Johnson, all rights reserved. Where were those Sugar pines that Douglas found? My own educated guess was formed by carefully tracing his self-described route on topographic maps. I believe his pines were found somewhere just east of the present-day town of Roseburg. A likely location was high on Lane Moutain's northern slopes. This mountain is 3,468 feet high and could have had good habitat for Sugar pines in Douglas' day. Climatic note of relevance: the Northwest's climate was much cooler in the early 1800s and Sugar Pines could have comfortably grown in locations that presently are too hot/dry. Please read my discussion of the LIA (Little Ice Age) for details. WHERE TO SEE SUGAR PINE IN OREGON: quoted from the National Park Service at Crater Lake National Park: "There are fine groups of Sugar pine at many points along the road from Medford to the park. One tree especially that may be seen about 8 miles north of Prospect is nearly 8 feet in diameter and contains 25,000 feet, board measure, of timber. [Coming into the Park via the southeast entrance] while ascending Annie Creek, the traveler who does not leave the road will fail to see the finest Sugar pines. It is well worth while to wander out into the forest away from the stream, and there find the tree at its best, towering among the yellow (Ponderosa) pines and firs and scattering its great cones among the ceanothus and chinquapin brush at its feet."